Planning a vacation or getaway that your whole group can be excited about can be quite a challenge! When your group includes individuals from different generations, bridging the gap between everyone's individual interests may seem impossible, but it is not! How can everyone be kept entertained and happy on a vacation that still works with your budget? A luxury cabin in Georgia holds the answer to your dilemma! Toccoa Swinging Bridge - Feeling adventurous? Love scenic views? One of northern Georgia's most popular destinations is the Toccoa Swinging Bridge. This exciting bridge is only accessible by foot traffic and is the largest of its kind East of the mighty Mississippi river at an astonishing 265 feet long. From there, incredible sights of northern Georgia and the Toccoa River can be seen. 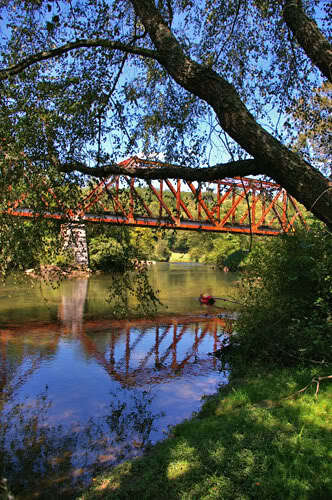 You can also enjoy the Toccoa River via the Blue Ridge Scenic Railway which will take you across another bridge over the gorgeous river and eventually across the Tennessee border for an entire day of fun and adventure! Tallulah Gorge Suspension Bridge - One of the most spectacular canyons in all of the nation can be found at Tallula Gorge State Park. The gorge itself is over two miles long and the park features many trails and overlooks for viewing the natural wonder. 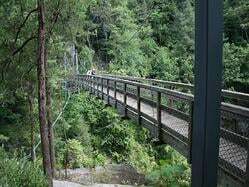 At nearly 1,000 feet deep, visitors will feel the excitement and thrill as they cross the gorge via a suspension bridge that offers even more incredible views! 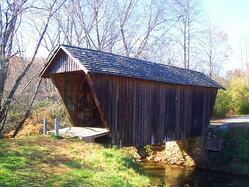 Stovall Mill Covered Bridge - Looking for romance? Visit the Stovall Mill COvered bridge crossing Chickamauga Creek near your Cabin in Georgia. Named for miller Frank Stovall, this bridge is extremely beautiful and features a picnic area for a romantic or fun afternoon. Under the Bridge - As you go on a tubing adventure down the Chattahoochee River via Cool River Tubing Company, you will drift peacefully underneath a bridge that runs through the lovely Alpine Village of Helen. You may wave at the tourists standing on the bridge, watching as you cross beneath their path, soaking up the sun while delighting in the cool waters of the river. As you float along, you will also bridge the gap between your group as people of all ages, genders, and backgrounds can enjoy the sights and sounds of northern Georgia together in a time of friendship and family bonding. Bridge the gap between worlds! Though some in your group may moan and groan about the idea of staying in a cabin, you would be astonished to see how luxurious a cabin in Georgia can really be! As those in your group who love spending tim in the great outdoors get to enjoy the cabin in the woods experience, your more finicky group members will delight in the comfortable accommodations and lush amenities. As everyone is delighted with the privacy and creature comforts that a cabin in Georgia can provide, you may see a bridge crossing that gap between two worlds! The fisherman may enjoy coming back to a soothing soak in the cabin's hot tub after a day in the fresh mountain air at the Chattahoochee River, and those who normally don't venture from the great indoors may find themselves delighting in viewing their own private waterfall from the cabin deck, going horseback riding, or evening embarking on a tubing adventure! Besides bridging the gap between the indoor folks and the outdoorsy types, you will also find that the bridge will be gapped between two worlds! 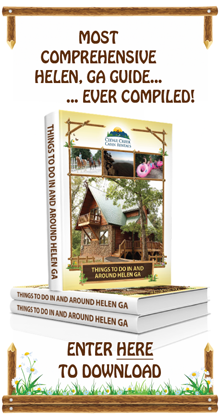 Located near to your cabin in Georgia, you will find yourselves immersed in a whole new world in the Alpine Village of Helen. This quaint and adorable area is reminiscent of old Bavarian life, featuring cobblestone alleyways, old fashioned shoppes, and Alpine style buildings! A host of unique opportunities greet you in Helen from a bicycle tour through the village, to a journey on a horse drawn carriage, enjoying a cold brew at a local pub, and dining in style. From mid September through the end of October you are also invited to the largest Oktoberfest celebration in all of the southern United States! A local favorite, Helen, Georgia Oktoberfest is also visited by tourists from all over the country and world to join in the fun fall festival! From the opening parade (which features the annual "tapping of the keg") to meeting new friends in the Festhalle, to polka dancing in the street, there is something for everyone! You'll feel like you have bridged the gap between time and space as you enter a world of old style Bavarian life!